The Ask Leo! Tip of the Day - Ask Leo! The Ask Leo! Tip of the Day is designed to be a short, easy-to-digest, and above all, useful bit of information about using your computer, technology, or the internet more effectively, and more safely. In fact, one day a week tips focus specifically on “The Basics”, those tips and tricks that we all take for granted, that everyone assumes. The things that, once you learn, can make a dramatic impact in your understanding and use of the powerful tools in front of you. Thank you Leo for your tips. I’m an avid follower. At the other end of the spectrum, once a week the tips focus on the Windows Command Prompt. From its roots in MS-DOS, the command prompt is a powerful, yet poorly understood environment. Both advanced, and intermediate users will techniques that – to be honest – are easier when performed using the Command Prompt. I love this tip — did not know it existed so a BIG thank you!! In between tips cover the gamut from keystrokes to security, from problem diagnosis to improving efficiency. And it’s not just about Windows 10! While the changes in Windows 10 certainly present many, many, (too many? ), learning opportunities, many of the tips span Windows versions all the way back to Windows XP. The Ask Leo! Tip of the Day is a reward offered at the Bronze or “BookWorm” level of Ask Leo! patronage. Tip of the Day: BRILLIANT idea! Well done. Did you catch the one about books? That’s up to four books a year – up to $80 in value all by itself. Plus the tips. Plus the archive. Plus priority. Plus a clear conscience. Sign up today! Become an Ask Leo! patron pledging at least $5 a month, and start getting The Ask Leo! 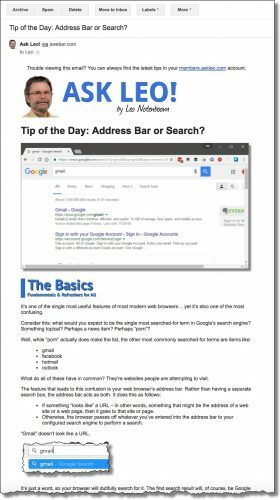 Tip of the Day – and everything else listed above – today.